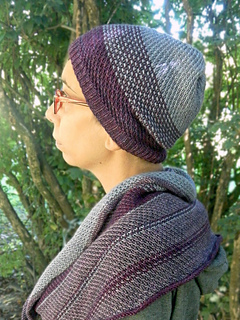 Kits available on Snail Yarn Etsy shop. 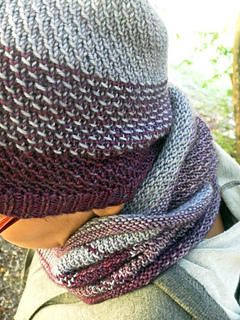 Stripes & Blocks is a quick slouchy hat seamlessly worked in the round from the bottom up. 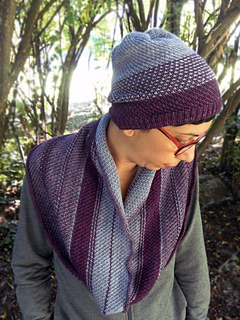 The hat features a basic ribbed brim and an easy textured slipped stitch pattern, livened with a stripe sequence for the central section ideal for gradient, self striping or high contrast yarns. Finished circumference at brim: 14¼ (16, 19½, 21, 24½) inches/36.5 (41, 49, 53.5, 62) cm. Height: 7 (8½, 8½, 9, 9½) inches/18 (22, 22, 23, 24) cm. Shown in size Adult XS worn on a 22 inch/55 cm head. 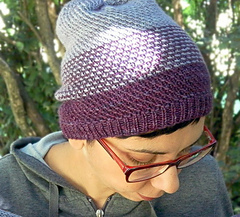 CA: 1 skein, shown in Aubergine; CB: 1 skein shown in Frosted Mallow. Approx. CA 75 (85, 105, 115, 135) yards/70 (80, 95, 105, 125) m; CB 90 (100, 125,135, 160) yards/80 (90, 115, 125, 145) m.
♡ US4/3.5mm DPNs or 16”/40cm circular needle or different size to obtain gauge. ♡ US5/3.75mm DPNs or 16”/40cm circular needle or different size to obtain gauge. ♡ 6 stitch markers (one in different colour). 26 sts & 36 rounds = 4 inches/ 10 cm in slipped stitch pattern on larger needle.